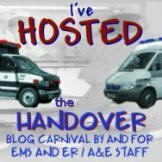 The latest edition of ‘The Handover’ blog carnival for all things EMS, ER and A&E, can be found over at ‘Life under the Lights’. CK, our host for this month, suggested the theme of ‘Funniest, Job, Ever’ which has brought in some fabulous posts from some of the finest in the emergency care blogosphere. Stop over and have a look, a giggle, and wonder to yourself if it’s right that you are giggling so much at others misfortunes! Next month the Handover will be at ‘The insomniacs guide to Ambulances’ with a theme of ‘Kids – seen but not hurt!’, but also with the new open feature for those who want to be part of ‘The Handover’ family but don’t have a relevant post to fit the theme for that month. Click here for further details of how to submit a post to Ben, or click here for general information on ‘The Handover’ blog carnival and how to be a host of a future edition. Thanks for the link buddy. Don’t forget to say that you were in there too. Your post was touching… and you got sprayed with amniotic fluid. Now only if there was a video of THAT!